According to World Health Organization (WHO), mental health is defined as a state of well-being in which every individual realizes his or her own potential, can cope with the normal stresses of life, can work productively and fruitfully, and is able to make a contribution to her or his community. 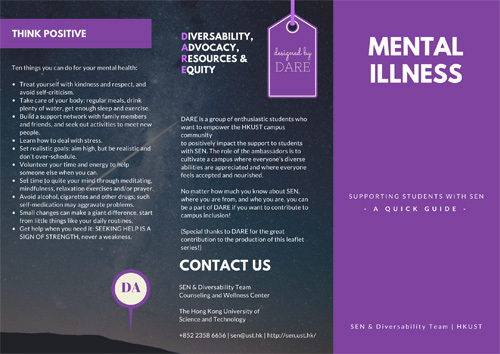 Students suffering from mental illness may find a diminishing capacity to cope with normal daily functioning including interpersonal, emotional, academic and physical aspects. The illnesses may cause by various biological, psychological and social factors with different manifestations. Common mental illnesses are listed below. It is important to note the signs and symptoms of different disorders in order to have proper treatment and intervention. The Library endeavors to assist users with special needs to locate information, retrieve materials, access services and use library facilities. Prior registration for these services is required.